Dubai has seen a rise of local and independent retailers delivering unique and innovative designs that challenge the offerings of well-known brands. Small pop-up stores that deliver a healthy dose of individuality and character. 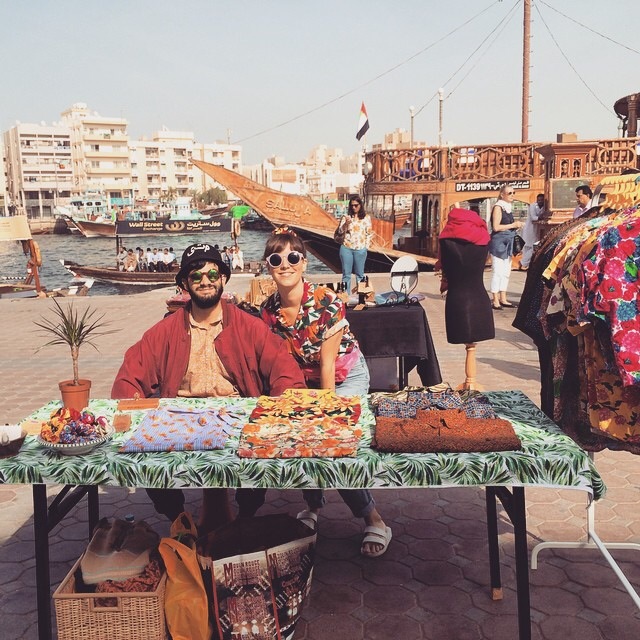 FNND found two people who have been busy travelling in search of fabrics in the souqs and markets of the world. So meet the creators of Yama Clothing. 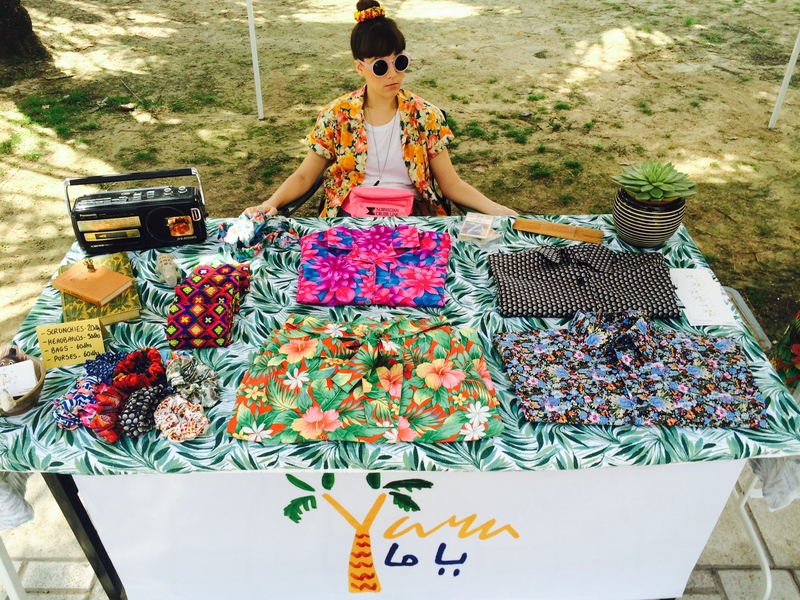 FNND met up with Beth and Kamal – the people behind the project to talk exotic fabrics, Sun Ra and scrunchies over a coffee. 1. 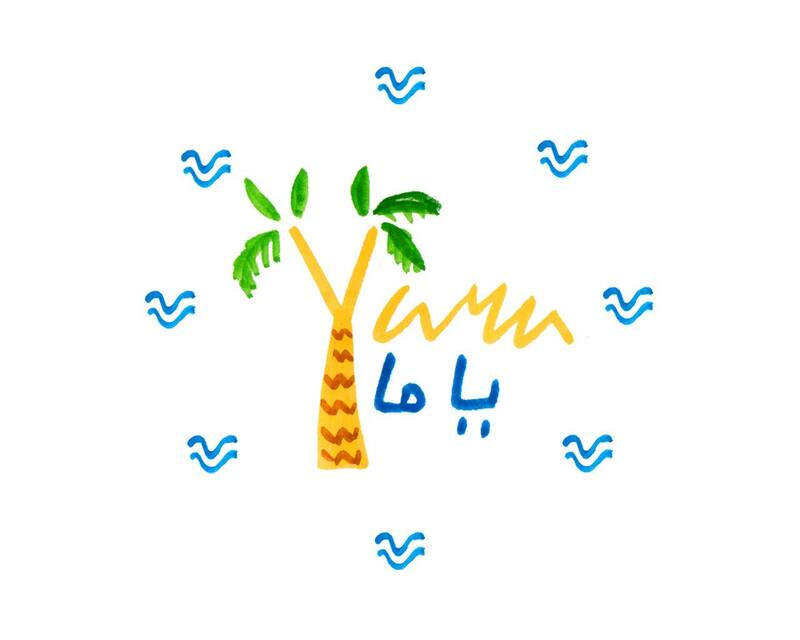 So, we really love Yama, what was it that motivated you to create it? Beth: There was a lack of clothing options that we were into in Dubai. So we often set out making our own with the many great tailors over here. We really enjoyed the whole process of picking out our own fabrics and turning them into one-off pieces of clothing, rather than buying a mass-produced item. So many people were asking where they could get one that the idea grew from there. We still only make very small amounts of each design to keep that personal feeling. Kamal: My parents spent a lot of the 80’s and 90’s making clothes for our family in Bahrain for similar reasons, so we took a lot of inspiration from that. There’s something very personal about visiting a market to seek out interesting fabrics and turning them into clothes, it’s exciting. 2. Where does the name Yama come from? Kamal: Apart from really loving how the word Yama sounds, it’s one of those names that means different things in different cultures. We chose it because we wanted a name that wouldn’t be tied down to one culture alone and it sounds like it could be from anywhere, similar to the fabrics we use. Beth: Kamal’s band Flamingods also have a song called ‘Yama Yama’ so the name was familiar from that too. 3. Do you take inspiration from Dubai or is travelling to other places a bigger resource for you? What is your favourite place to hunt fabrics? Kamal: We take influence from wherever we currently are. Every great city has things happening beneath the surface and places to explore and seek inspiration, Dubai is no different. A bit biased, but my favourite place to shop for fabrics is the Bahrain Suq, I grew up visiting the market with my family to shop for spices, helwa and fabrics, their selection of 60’s and 70’s style prints never ceases to amaze me. Beth: Bahrain is where it all started, so we’ll always have a soft spot for the fabric shops in Manama. Dubai is great as a resource for us getting started, so many cultures are here. If you search hard enough you can really find fabrics from all over the world. But travelling is our greatest inspiration. 4. Designers seem to be more inspired by vintage. Why do you think designers are often referencing the past? Is it a good thing? Kamal: Theres something a bit more romantic in looking to the past for inspiration and finding beauty in things that aren’t so obvious. The prints we use are a homage to the past as they aren’t seen so much these days. We like the idea of reminding people of these distant designs or maybe even introducing it to them. Beth: We’ve always had a fondness for vintage clothes, in fact the cuts of our clothes are modelled after vintage items. I think it’s part of not wanting the designs to feel like something you’d pick up at a mall. 5. Who are the designers you look up to? Kamal: We don’t actually consider ourselves designers. 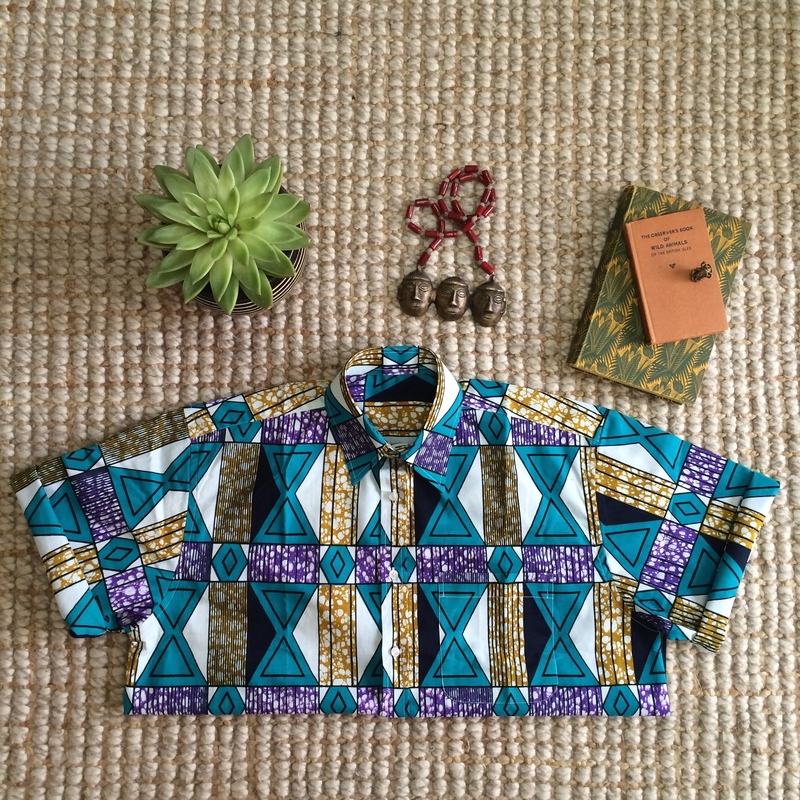 We’re more like fabric curators or cultural explorers. 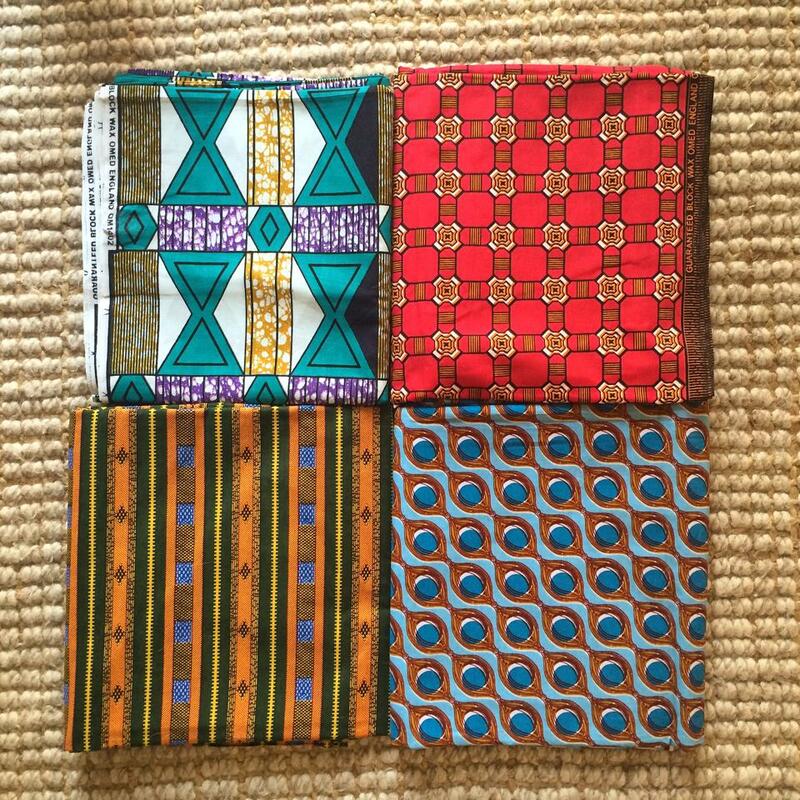 Beth: There’s a few people doing great things with fabrics though, I recently came across a brand in Australia called Yevu Clothing that make awesome clothes with beautiful bright fabrics from Ghana. But generally we try not to pay too much attention to what other people are making. 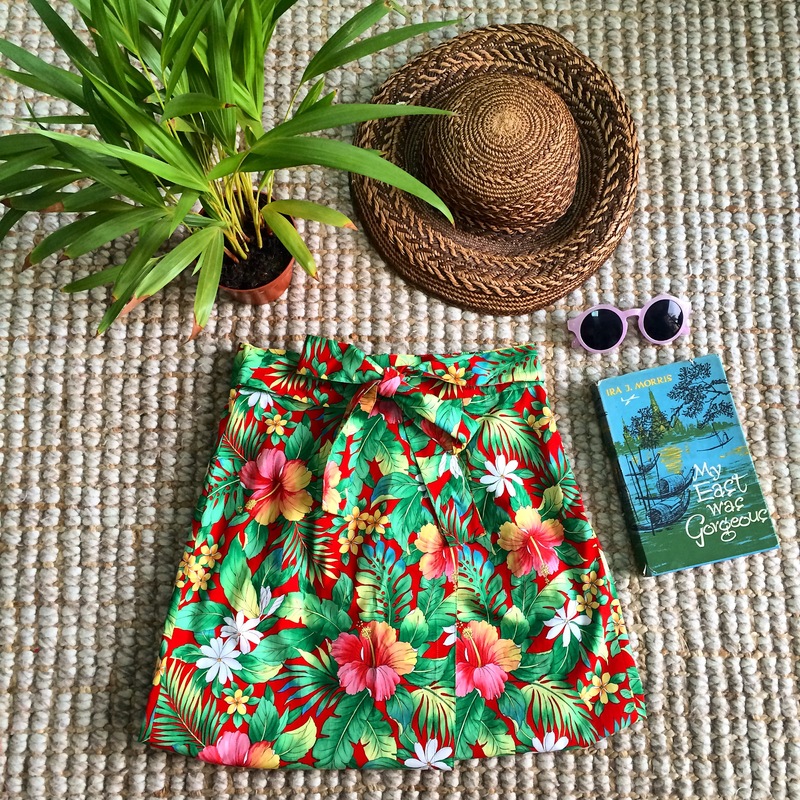 Beth: Our red tropical print wrap skirt (photo attached). It’s one of those items that I have to stop myself from stealing! Kamal: We’ve been wanting to make Yama bucket hats for a while now using West African fabrics so I think that’ll be coming up next and will probably be my favourite. 7. You both run Yama together. Do you always have similar tastes in design? Is there anything you disagree on? Beth: Luckily we both have pretty similar tastes! Although there has been a couple of occasions when Kamal will pick out a particularly outrageous fabric that it takes me a while to warm to. I usually come around though. 8. What vintage item would you love to find? Beth: Anything worn on Beverly Hills, 90210. I’m suffering from a years-long obsession with the uber-90s style on that program. Or failing that, I really want some traditional Peruvian embroidery, a poncho dress or skirt perhaps. 9. If you could design a costume for anyone – who would it be? Beth: Sun Ra’s Arkestra. Decking them all out in colourful Yama-style robes would be awesome. 10. what is the top of Kamal and Beth’s list of things to do in 2015? Kamal: Travel and collect more exotic materials and inspiration. Beth: Scrunchie Revolution! We make hair scrunchies with all the leftover fabrics after having the clothes made. I never thought scrunchies would provoke such strong reactions. Some people love them, some hate them! My aim for 2015 is to make Dubai fall in love with the scrunchie.